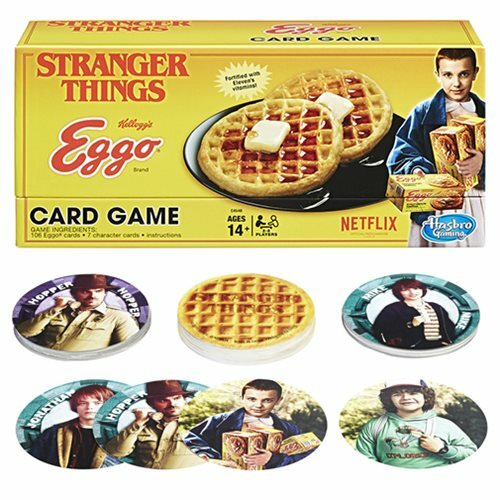 Play as one of the characters from original Netflix series, Stranger Things in the Stranger Things Eggo Card Game! Play as Will, Mike, Lucas, Dustin, Eleven, Hopper or Barb! Each card played can either send a player's character to the upside down, make an opponent draw 2 cards, reverse the order of play, summon the Demogoron, or cause a rift that sends everyone who was Right Side Up to the Upside Down, and vice versa! Players must escape from the Upside Down and get rid of all their Eggo cards before the Demogorgon attacks. Succeed, or be toast! Includes 106 Eggo cards, 7 character cards, and instructions. Ages 14 and up. 2-6 players. Do not eat.